Rarely will you find me applauding a hotel that lacks such basic amenities as heating or air-conditioning, much less one whose rates begin at over $1,000 USD per night and rise considerably from there. Under normal circumstances, I’d also take issue with a resort that boasts only a single restaurant (though guests can access more dining options at a neighbouring resort), has no central pool and is a steep climb of some length from the beach. On paper, such a place would appear to be lacking many of the prerequisites associated with a five-star resort. Furthermore, if I was travelling anywhere else in the world, arriving at my hotel after a long flight to find an entire wall missing and litres of water filling my room, it would prompt a frenzied call to my travel agent with images of litigation dancing through my head. But, this isn’t anywhere else in the world. 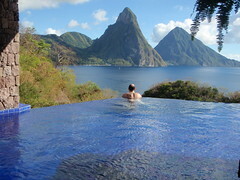 This is St. Lucia, and I’ve just checked into my luxury suite at Jade Mountain in Anse Chastanet. And after spending four nights in blissful luxury as a guest of Jade Mountain, I can safely say that the question is not whether you want to come to Jade, but whether you can. If that Christmas bonus is burning a hole in your Hugo Boss trousers, the question has now been answered. The Crime Traveller was a guest of Jade Mountain during his stay. For extended commentary on the unique nature of the resort and insider insights gleaned from dinner with owners, Nick and Karolin Troubetzkoy, visit the Crime Traveller’s blog at www.TheCrimeTraveller.com. When not jetting around the world as his alter ego, The Crime Traveller, Edward Prutschi is a Toronto-based criminal defence lawyer. Follow Ed’s criminal law commentary (@prutschi) and The Crime Traveller’s adventures (@crimetraveller) on Twitter, read his Crime Traveller blog, or email ed@thecrimetraveller.com.